We’re willing to bet that as recently as a couple of years ago, you weren’t even aware of Voopoo’s existence. Today, though, the little vaping manufacturer with the funny name now seems to be everywhere. Voopoo’s amazing Gene chip is the reason for that. The Gene chip is the brain that powers Voopoo’s vaping devices. The current-generation Gene.Fit chip is the result of 15 months of research, more than 160 vaping tanks tested and more than 11 million previous-generation Gene chips mined for data. Gene.Fit helps your tanks last longer, and it fires a coil faster than you can blink your eye — and if you want the best experience with a Voopoo vaping device, you’ve got to have some Voopoo coils. 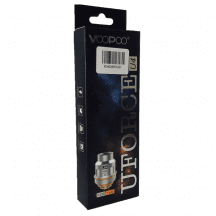 What’s great about products like Voopoo Uforce coils? When you buy a Voopoo Uforce tank, you’re buying into an entire ecosystem in which virtually all of the coils work with the entire series of tanks. When Voopoo comes out with a new Uforce tank, you can upgrade knowing that you can enjoy the benefits of the new tank without needing to choose a new favorite coil. You’ll always find the best prices for Voopoo coils right here. We ship all retail orders of any size for free, and we always guarantee that we sell nothing but authentic factory-direct coils.